The older the motorcycle, the simpler its' electrical system. Pretty straightforward right? If you go back far enough, the electrical system was a spark generator, and a spark arrestor. Even when lighting first came along, it was acetylene and other gas varieties. The first horns were air bulbs, so no need for electricity there. It took the need for a brake light to really propel the need for an electrical system with wiring running fore and aft. Today of course there are miles of wiring in most motorcycles, and diagnosing the electrical system is beyond most of us DIY mechanics. This, however, was not the case on my 1965 BMW R50/2. It has a magneto, headlight, tail light, horn, and two indicator lights for charge, and headlight/high beam. No turn signals, no heated seats, no beverage chiller. There is a single little circuit board in the headlight bucket to which all of the wiring runs. The wiring harness exits the headlight bucket, splits off a few wires for the horn button and high beam switch, and then runs the rest back for an aux socket, battery, brake switch, and tail light. That's about it. When my tail light began to work intermittently, it should have been a simple matter to find the problem and fix it, yes? No. A 45 year old motorcycle with a 45 year old wiring harness is surprisingly resistant to quick fixes. This is what helps to make vintage vehicle ownership a thinking man's pursuit. first I replaced the tail light bulb. The light was brighter, but a short run that evening proved that the problem still existed. The light simply turned off about 15 minutes into the run. It then came back on a few minutes later, then off again, then on back at the garage. No obvious clues like hitting bumps, or under load, or after some consistent period of time. 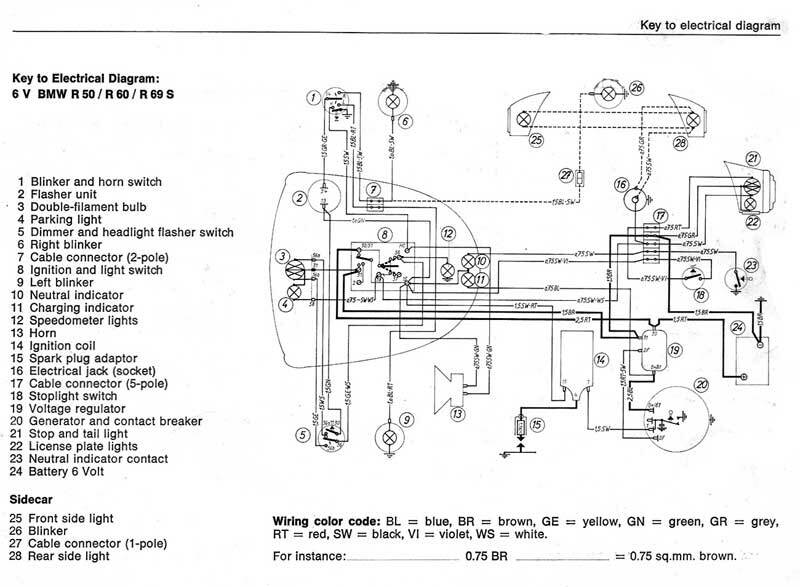 I got out the shop manual and looked over the wiring diagram. Yep, it was dead simple, and no obvious way that a suspect horn switch could cause the problem. I played with the switch anyway to see if I could produce the fault. All I succeeded in doing was sounding the horn 20 times, which brought the family running out to the garage with looks of concern first, and then irritation. I checked continuity and current. All was well according to the multimeter from the tail light, to the diode board. Of course, the problem only happened when running. I uncovered nothing that hinted at the problem. I was hoping to uncover some aged brittle insulation or a chafed wire, but everything looked good. I went for a (hopeful) ride. The problem with an intermittent problem is that it is hard to know when you have it solved. The ride produced no sign of the fault, but it was only 30 minutes. I didn't ride this bike a lot at night with it's 1960s lighting system, so 30 minutes was about as long as I had ever gone. The other challenge is that you can't exactly monitor a tail light very well while riding. If it was flickering or going out briefly, I would not know. Despite this, I decided to declare success. It was about 3 months later that I had a 45 minute ride home in the dark with the bike. The fault really appeared to be gone. Why? I don't know. Was it gone for good? I don't know. As an engineering type, this is not a satisfying conclusion. You want to find root cause and know that failure F1 lead to result R1 and was remedied by solution S1. Accordingly I am concluding that a faulty soldering joint and a slightly corroded ground conspired to interrupt the circuit due to harmonic vibrations when the motorcycle hit 49.6mph. Echoes of those harmonics persisted for a short period of time and then dissipated. That's my story and I'm sticking to it.